17 years ago, there were only around 10 commercial zipline courses in the United States. Today, there are over 400! It is safe to say that ziplines are having a moment right now, and we couldn’t be more excited to be part of this nationwide trend. 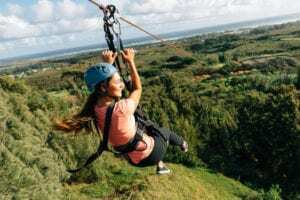 Here at CLIMB Works Keana Farms, we offer thrilling zipline tours of Oahu’s North Shore that boast unparalleled views of the mountains and the ocean. Have you ever wondered how ziplines became a worldwide phenomenon? Our team did a little digging to bring you the fascinating history of ziplining. Believe it or not, ziplines have been around for hundreds of years. In mountainous areas like the Himalayas and the Alps, ziplines were used as a mode of transportation and as a way of sending supplies from place to place. Folks living in remote areas often preferred ziplines to bridges because they were easier to build and quicker to use. Despite the centuries-long history of ziplines, modern recreational courses can trace their origins back to the 1970s. It was during this time that Donald Perry, a graduate student at California State University, Northridge, was doing research in the rainforest of Costa Rica. Perry was pursuing a doctorate in biology and he was fascinated by the diverse wildlife found in the forest canopy. Navigating through the trees of the jungle was not an easy task, as tree limbs were prone to breaking and they were crawling with a variety of poisonous insects. Originally, Perry used a crossbow to shoot a rope into the branches of trees so he could climb them. The locals started calling him el Hombre Mono (the Monkey Man) because he was the only person bold enough to climb through the canopy. Donald Perry’s inventive way of exploring the rainforest soon attracted media coverage from Smithsonian Magazine, Scientific American, and Geo (Germany’s National Geographic). Perry’s exploits in the jungle even earned him a consulting role in the 1992 movie Medicine Man, in which Sean Connery ziplines through the Amazon rainforest to find a cure for cancer. Inspired by Perry’s ziplines, Canadian entrepreneur Darren Hreniuk built the world’s first recreational zipline course in Monteverde, Costa Rica in 1995. Although Hreniuk tried to patent the concept and aggressively block rival course from opening, the courts ultimately ruled that zipline technology belongs in the public domain. 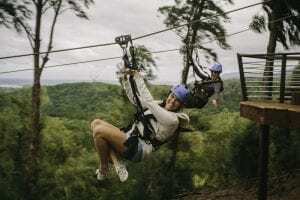 Over time, ziplining became a hugely popular tourist activity in Costa Rica and it has since spread all around the globe. Today, 72 countries boast commercial zipline courses. We hope that reading about the history of ziplining has put you in the mood to plan your own adventure above the treetops. To book your zipline tour of Oahu’s North Shore, click here!